DatAnswers delivers relevant search results to the people who should have access to them, and only the people who should have access to them. "Very powerful, but clunky GUI"
This product is able to scan for multiple compliance's, and make sure you are within compliance. This is great if you need to meet specific compliance's. It also is able to monitor folders for access attempts, and report on NTFS and share permissions. The GUI is incredibly clunky, and a pain to navigate. I also don't like having to have it installed by their technical team. They connect via Join.Me and set everything up, and they HAVE to use an administrator account. If you have the money for this, then it is a great product. They won't give you cost up front. It was going to end up costing us $40,000 to implement this in our environment. There are much better uses for that money. If I recall, each user came out to $100, plus, you also have to pay per server you wish to monitor. Compliance and file monitoring. It is able to report on ransomware attacks as they are happening as well. Create and manage a search experience tailored to your specific needs in no time, thanks to seamless indexing, best-in-class relevance and intuitive customization features. Algolia is an API built for developers that delivers relevant results in your mobile apps and websites from the first keystroke. Amazon Elasticsearch Service makes it easy to deploy, secure, operate, and scale Elasticsearch for log analytics, full text search, application monitoring, and more. Introducing the new IBM® Watson Explorer - a cognitive exploration and content analysis platform that lets you listen to your data for advice. Explore and analyze structured, unstructured, internal, external and public content to uncover trends and patterns that improve decision-making, customer service and ROI. Leverage built-in cognitive capabilities powered by machine learning models, natural language processing and next-generation APIs to unlock hidden value in all your data. Gain a secure 360-degree view of customers, in context, to deliver better experiences for your clients. SLI Learning Search patented technology learns from visitors' site search activity and clickthroughs to deliver the most relevant results, so your customers find what they want quickly. Cludo's cloud-based search solution is designed to power search no matter if the website is based on WordPress, Umbraco, Sitecore, Drupal or another technology. Google delivers relevant results that increase the usability and value of your business information. Apache Solr is an open source enterprise search server based on Lucene search library, with XML/HTTP and JSON APIs, hit highlighting, faceted search, caching, replication etc. 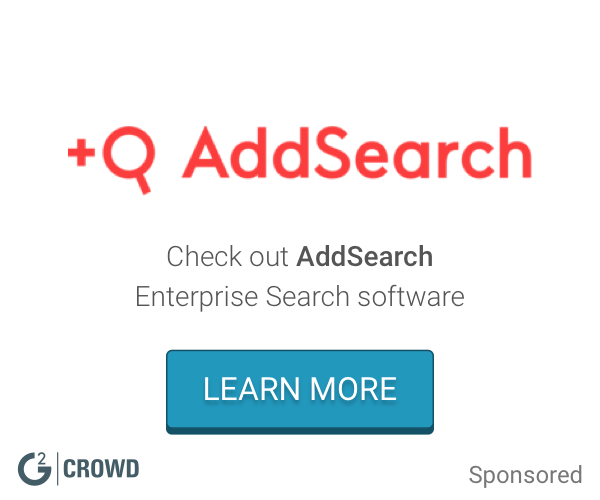 AddSearch is a site search that helps your website visitors find what they want - instantly, accurately, and visually. * We monitor all Varonis DatAnswers reviews to prevent fraudulent reviews and keep review quality high. We do not post reviews by company employees or direct competitors. Validated reviews require the user to submit a screenshot of the product containing their user ID, in order to verify a user is an actual user of the product. Hi there! Are you looking to implement a solution like Varonis DatAnswers?